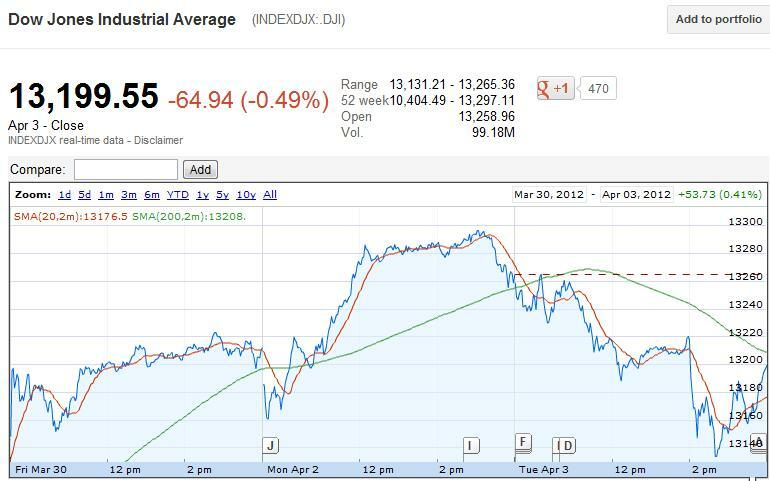 As expected it was a bearish day with stock selling off after FOMC minute hinted no QE3 and raised the forecast of GDP. 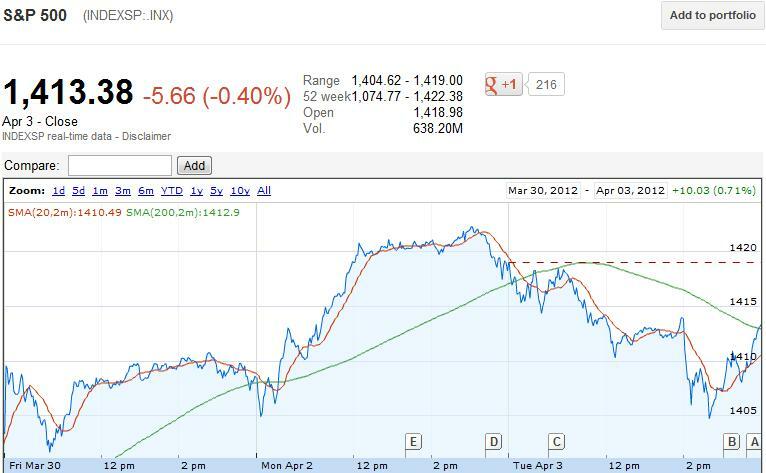 Dow dropped 130 point and S&P500 dropped 16 point before recovering half of its losses. The weird thing about this market is that it has been rallying up with so called "Good economic data". Everybody knows not only US economy but the Global economy is in slowdown phase and stock market has been over inflated. Except the headline number of US unemployment rate, rest of the economic data is weaker then 2009-2010. FED, ECB have spoiled the global market with their "FREE MONEY" printing press policy and everytime there is bad data, the expectation of easing is out in this market. If they don't print free money or even think of raising rate or tightening policy, then the market will drop and vice versa. In past Government use to decide policy for the people but this days policy are decided to keep wall street happy. This days wall street control the government rather then government controlling wall street. The technical level to watch out for April 4th is as follow: The chart is still little bearish but it can change to bullish if the resistance level is broken. ECB will be big mover in Premarket. For bearish sentiment to continue, Dow needs to break 13170 level, S&P500 needs to break 1408 level and Nasdaq needs to break 3106 level and close below that level. For bullish sentiment to continue, Dow needs to break 13240 level, S&P500 needs to break 1418 level and Nasdaq needs to break 3115 level and close above that level. For 2008 crash like scenario, Dow needs to break 12105 point, S&P500 needs to break 1268.5, ans Nasdaq needs to break 2707 point, which at the moment looks impossible. Watching puts in AAPL, PCLN, MA, V, FAS, DIA. SPY. Also watching UGL, GLD, KERX to take small position. Remember this Friday stock market will be closed and the most important job data is coming out on Friday.So take your position carefully.